It took me the last 2 years or so to face a fact that im no longer young. Born in 1991, im now almost 21 and friends around me are either engaged or getting married. Wedding invitationals would be probably triple what i am receiving right now if i am actually living in my home country. But some of them are my very close friends and i feel like its my duty, as a decent human being, to send them to congratulate and wish them a happy life together. Traditionally, hard cold cash is the way to go. It also a way to help young weds like this to sustain their own life instead of living with their parents after weds. But something change my mind yesterday when i had to go to Canadian Tire to buy some cleaning tool with my roommate: a knife. I have always have a special thing for tools in general and sharp, very sharp tool specifically. I remember my paper knife collection back in high school and how i always carry at least 1 around when i do volunteer job for the school. You never know when will your scouting skill will come in handy in volunteer jobs . But yeah, a knife, or a knifes set. Kitchen knife of course. I did my research few years ago when i started living by myself: Santoku Japanese made knife is the best multi purpose knife and should be the best candidate for me to purchase for myself as well as for my friend. This summer i will be working really hard, saving up a bunch for 1. Anyway, if you guys have any knowledge about Santoku or just kitchen knife in general, please do share. Try the Victorinox line. My first two knives came from that brand and, despite cooking just about every single day, they are going strong. They keep the blade longer than e.g. Kitchen Aid or Cuisinart (though not as good as a top quality Henckles knife I used a long time back) and don't cost much at all. I personally prefer the Chef's Knife over the Santoku, but it's all a matter of opinion there really. There's really not much you can't accomplish with either knife even though sometimes it won't be optimal or efficiently done. The thing I didn't really think about as much as I wish I had before was the cutting board. A good cutting board makes infinite difference in my opinion and a nice bamboo one feels like it keeps the blade sharper and holds the food much better than one of those plastic cutting boards (though there's probably nothing wrong with those either and it's possible I just bought ones that weren't as good!). Alton Brown video? About knives? yeah personally i prefer santoku simply bc i like a taller blade. My hand is really shaky(naturally born with it T_T) so a taller blade could helps out time to time while a longer one is just in the way if you have a small kitchen. I came from south east asia so a good wooden chopping board isnt too hard to find. In fact, the bamboo ones are pretty damn cheap if you know where to get them. Its mostly the knife that im worried about. Even if i bought 1 for my friends, what if they just dont know how valuable it is and cant maintain it correctly T_T. I can definitely understand that. You have to go with what's comfortable for you! But yeah, the whole keeping it sharp and in good order is a hard part of knife ownership - especially since they'll need a sharpener - but there's not really much you can do about it. Maybe learn how to use it well and teach them! A couple of friends and family members were relieved to learn proper knife care and use techniques simply because they didn't know how to use them. Perhaps your friends would be the same way? Buying the right knife depends a lot on what type of person you are, how much cooking you expect to do, how much money you expect to spend, how much longevity you're looking for, and a ton of other things. I'd say try out a few knives before making your purchase, and at least know how long a knife you want. Smaller people prefer smaller 6-7 inch blades, a tall person might want a 10-inch. You can get a good entry level chef's knife for about $25 dollars and a honing steel for less than $20. It will last you quite a while with proper care. I suggest starting with a cheaper knife (which is about 90%+ as good as a top of the line knife anyways) until you know what you want. A final anecdote: I know of a cook who has used the same entry level Wustof Classic 8-inch Chef's knife (A $60+ knife) for 12 years. It is still shiny and looks new despite heavy daily usage. I also know another cook who bought a top of the line Mercer's 10-inch Chef's knife ($200+ knife) about two years ago. It looks battered and beaten. A few weeks ago the tip of the knife snapped off. You may wish to consider the longevity of expensive objects around you and whether or not it's worth it to invest in an expensive knife. Owned one for the last 10 years and still cuts through bone like butter after regular sharpening with a wetstone. The only downside is that you need to be careful with these as you will seriously take your finger off if you are not careful. Price is geared toward long term investment. I strongly second the Victorinox suggestion, they're definitely your best deal in functional workhorse knives. If you go into professional kitchens you'll usually see a lot of Victorinoxes because they use pretty good steel, have nonslip handles, and are relatively cheap. I would not recommend getting a Japanese-made knife (as opposed to a Victorinox in the santoku shape) since the Japanese tend to harden their steel to a higher degree. On the upside, it makes Japanese knives take a finer edge, but the massive downside (especially with roommates) is that it makes the blade easy to chip and shatter. Pricewise, if you want to get a really pretty handcrafted Japanese Damascus steel santoku, you should expect to pay well over 100$ a knife (how much over varies a lot from knifemaker to knifemaker) while the Victorinox should run you in the neighborhood of 30-40$. PPS: As long as your knife is in pretty good shape, your skill with it matters a lot more than whether it's a 30$ Victorinox or a 500$ handcrafted work of art; practice your knifework once you get the knife, it will pay off. As far as wedding gifts go, I suppose it's always good to give the couple whatever they need, or whatever you're certain will make a good gift Otherwise, cash is always a safe bet. Look into cutco cutlery they make some good stuff as well as a lot of the higherend german brands. just to check out how the size work out. I am 1.8 meter tall so i dont really have problem handling long/big knife. It just that the current chicken im living in might be too small to store a big one carefully. I have never in my life had a chance to work in a proper kitchen in asia im kinda oversize for most of the stuff and in canada, finding a highclass kitchen does come with a price. but yeah, i kinda wana test out the knfe my self before sending my friends one. And i dont really wana send a cheap knife either, they are my close friends so saving up a bit should not be a big deal. I could probably afford the japanese one. The thing worried me most about is if they use the knife instead of making it some sort of decorative object. If they wana use it i definitely will have to give them some notice when i hand the gift over. :-/ This is probably the biggest flaw of the plan but meh... i hope it will work out some what. I do however consider purchasing a victorinox for my mom before i go home so i will definitely keep it in mind. 30$ for a good victorinox? O_o ... Last time I checked I'd have to pay more than that in Euro for one. I hate you guys. I'm not sure if that stuff is available overseas, but I'm a huge sucker for WMF when it comes to kitchen equipment. 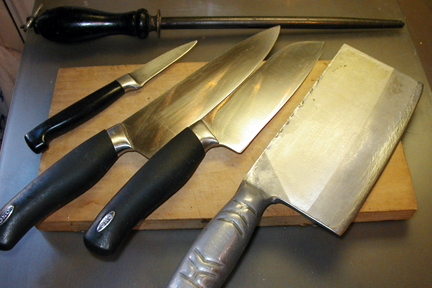 Some of their kitchen knives have been used by e.g. my grandma for like 25 years and besides some basic sharpening here and there they need like no maintanence and just do their job properly. I used to live with a cook as my roommate and I remember him using neither WMF/Victorinox but some different brand where each knive did cost 100+ Euros. Don't remember what it was at all though. What I DO remember however is that he once told me that the japanese Damascus knives are rather hard to get if you're trying to buy in your average store because there are so many cheap copies around, that might be something to consider.